As already mentioned, June 1921 was a particularly bad month for country house burnings in north-west County Cork. 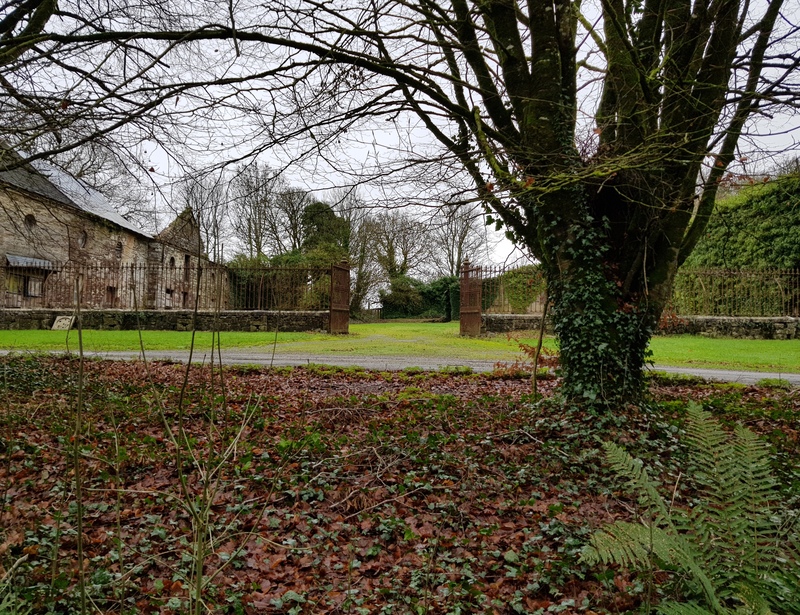 One of those then lost was Rye Court, seat of the Tonson Rye family: the Ryes were originally living in Cork city (where one of their number was mayor in 1667 and 1668) but had moved to Ryecourt before the end of the 17th century. There they built a fine house and, at some date in the second half of the 18th century changed their name to Tonson Rye as a result of marriage into another family. Ryecourt looked south over a fine parkland, many trees of which still survive but the building was gutted by fire in 1921 and subsequently demolished (a small house was built inside the adjacent walled garden). Immediately behind the old house stood a courtyard with offices to east and west, and with gates and railings closing its north side: all these survive, albeit in poor condition, as can be seen here. Like many words in the English language, ‘lost’ is open to diverse use. It can, for example, mean missing or misplaced but just as often is employed to denote something that has vanished, perished or been destroyed. Such is the case with an engrossing – albeit chastening – book recently published, Lost Ireland: 1860-1960. Author William Derham has trawled through thousands of photographs to select 500 images of buildings throughout the island, the majority of which have entirely disappeared or else been so altered/mutilated that they no longer bear any semblance to their original state. In a thoughtful introductory essay, Derham provides an historical context for why so many older buildings in Ireland should come to have been lost and laments the disappearance of certain building types such as the early unfortified house represented by Eyrecourt, County Galway: dating from the second half of the 17th century and still intact less than 100 years ago, it is now a roofless shell. Likewise Ireland has no examples of the ‘cagework’ urban house in which the frame would be of wood and the spaces between filled with wattle and daub. The last of these to survive, in Dublin on the corner of Castle and Werburgh Streets, was demolished as long ago as 1812. Likewise the once-widespread brick gabled townhouses known as Dutch Billies are now almost extinct, or else subsumed into later buildings. Some losses – notably among the ranks of the Irish country house – are already well-known, but even here Derham finds examples likely to be unfamiliar to most readers, and explains the shameful role played in the erosion of their number by that state body the Land Commission. However he covers many other areas of depletion and, frankly, dissipation, such as the damage inflicted on Roman Catholic churches and cathedrals in the aftermath of the second Vatican Council. Using the excuse of a new liturgy, members of the Irish clergy stripped interiors of the buildings for which they were responsible: one of the most egregious examples being the gutting of Pugin’s Killarney Cathedral at the instigation of then-bishop Eamon Casey. Tellingly their clerical equivalents in other countries did not feel impelled to engage in similar acts of vandalism. But valuable secular buildings were also squandered for no good reason, such as the demolition in 1964 of a fine mid-18th century market house in Mountrath, County Laois – supposedly because a public lavatory was needed (although this was never built). As much as an exhortation to protect what remains as a requiem to what has gone, this is a beautifully produced book and allows us to find again, if only in photographic form, what has been lost. Do acquire a copy while you can as it is certain to sell out. Lost Ireland: 1860-1960 by William Derham is published by Hyde Park Editions, price £39.95/€49.95. The photographs above were taken at a recent exhibition in Dublin Castle to coincide with the launch of the book. They show (from top), Roxborough Castle, County Tyrone (burnt 1922), Longford Castle, Longford (demolished 1972), Woodstock, County Kilkenny (burnt 1922) and Ballynastragh, County Wexford (burnt 1923). The exhibition has now ended but deserves to travel to other venues around the country in coming months; why not encourage your local arts centre/library to borrow it? As many readers will be aware, this weekend Ireland marks the centenary of the Easter 1916 Rising, the event deemed to mark the onset of the country’s drive towards independence from its neighbouring isle. The Easter Rising was marked by destruction, not least of human life: there were 485 fatalities, more than half of them hapless civilians who had the misfortune to find themselves caught up in the affair. There was also huge destruction of buildings in the centre of Dublin, most especially around the section of O’Connell Street closest to the river Liffey, since the rebels chose to centre themselves inside the General Post Office. 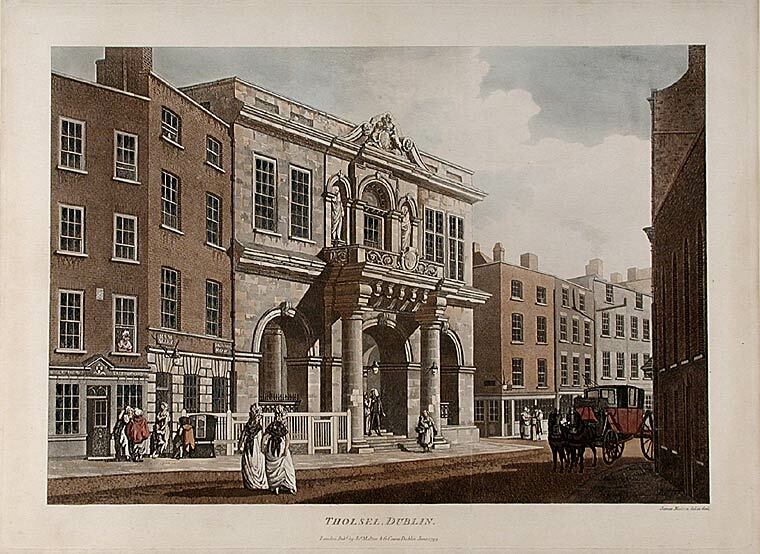 This building, designed by Francis Johnston in 1814, was entirely gutted while another casualty was the Royal Hibernian Academy on adjacent Lower Abbey Street which the architect had not only designed but also funded in 1824. An exhibition currently running at the Irish Georgian Society premises, 58 South William Street, Dublin unfolds the architectural history of O’Connell Street from its origins as Drogheda Street, through a long period as first Sackville Street, to its more recent incarnation. In many respects the show is unintendedly melancholy, since it forces the visitor to reflect on the thoroughfare’s steady decline from a heyday in the mid-18th century to today’s gimcrack circumstances in which O’Connell Street is predominantly given over to fast-food outlets and slot-machine emporia. Several of the photographs featured are of what was perhaps the finest property on the street known as Drogheda House. Filled with superlative rococo plasterwork, this was originally built in the 1750s for wealthy banker Richard Dawson before being bought in 1771 by Charles Moore, sixth Earl (and later first Marquess) of Drogheda from whence came the building’s name. Sold again after his death in 1822, the house was by the end of the 19th century divided in two, becoming respectively the Hibernian Bible Society and the Dublin United Tramways Company. Drogheda House stood sufficiently high up O’Connell Street to survive the Easter Rising, but this area was then caught up in fighting during the course of the Civil War in 1922: the building was entirely gutted, and later demolished. Over the course of this anniversary weekend, it is worth recalling what was (often unnecessarily) lost, as well as what was won. Ireland’s Main Street, 1625-1925: An Architectural History runs at the Irish Georgian Society until May 15th. Below are three houses featured in Georgian Mansions in Ireland, with a selection of the pictures included in the book. The line drawings are by the architect Richard Orpen, who had been in partnership with Dickinson before the outbreak of the First World War. Platten Hall, County Meath dated from c. 1700 and was built for Alderman John Graham of Drogheda: Maurice Craig proposed the architect responsible was Sir William Robinson. Built of red brick and with a tripartite nine-bay facade, it was originally three-storied but the uppermost floor was removed in the 19th century. Alderman Graham’s son William Graham married the Hon. Mary Granville, second daughter of George, Lord Lansdown and cousin of the inestimable Mrs Delaney who visited Platten on several occasions during her first marriage (when she was known as Mrs Pendarves). Sadleir and Dickinson quote one of her letters from January 1733, in which she described a ball given in the house: ‘we began at seven; danced thirty-six dances, with only resting once, supped at twelve, everyone by their partner, at a long table which was handsomely filled with all manner of cold meats, sweetmeats, creams, and jellies. Two or three of the young ladies sang. I was asked for my song, and gave them “Hopp’d She”; that occasioned some mirth. At two we went to dancing again, most of the ladies determined not to leave Plattin till daybreak, they having three miles to go home, so we danced on till we were not able to dance any longer. Sir Thomas Prendergast is an excellent dancer – dances with great spirit, and in very good time. We did not go to bed till past eight; the company staid all that time, but part of the morning was spent in little plays. We met the next morning at twelve (very rakish indeed), went early to bed that night, and were perfectly refreshed on Saturday morning. …’ As for Platten when they knew it, Sadleir and Dickinson comment: ‘Like all early Georgian houses, the main entrance is on a level with the ground; it opens into the imposing hall, which contains a handsome grand staircase in three flights, supported by six Ionic columns, the floor being paved in black and white marble. The walls are panelled, and there are other symptoms of early construction; there is some tasteful decoration, the frieze being very richly carved, and displaying tiny figures, quite Jacobean in treatment. Note, too, the gallery, which we also illustrate, with its handsome balustrading, with ramps at the newels. Below the gallery the panels are in plaster. Platten Hall was demolished in the early 1950s. The core of Turvey, County Dublin was built in the 16th century by the lawyer Sir Christopher Barnewell and the property thereafter passed down through various branches of the family across some 400 years. In the late 17th century the property was converted into a house of nine bays and two storeys with a gabled attic: the latter became an attic storey with a parapet and three lunette windows towards the middle of the following century. Turvey had an interesting Baroque entrance door with semi-circular pediment and urns. Inside there was excellent early Georgian panelling and a splendid rococo ceiling in the library. Turvey was demolished, amid some controversy, by property company the Murphy Group in 1987. Desart Court, County Kilkenny was built c.1733 for John Cuffe, first Lord Desart, its design attributed to Sir Edward Lovett Pearce. An example of Irish Palladian architecture, the house rose two storeys over basement and was linked to two-storey wings by niched quadrants. The centre block of seven bays was distinguished by a central feature of four superimposed engaged Doric and Ionic columns and a rusticated doorway beneath a first-floor rusticated niche; the garden front followed a somewhat similar pattern but only had engaged Ionic columns on the first storey. The interiors were notable for elaborate plasterwork ceilings in the entrance hall and drawing room, and for a pair of staircases with carved scroll balustrades. 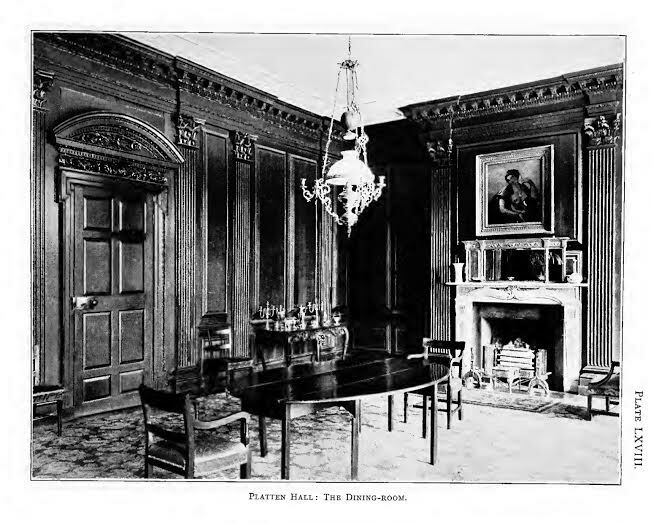 Sadleir and Dickinson were understandably impressed with Desart Court, noting, ‘The three reception rooms facing south, of which the centre is the drawing-room, all communicate, that to the left being the boudoir. The drawing-room, a wellproportioned and nicely lighted apartment, has an elaborate rococo ceiling displaying much originality of design, and doubtless contemporary with that in the hall. Heads are introduced at intervals as well as masks; the latter an unusual feature, which we also found in the attic story at Florence Court. The colouring is cream, picked out with of the joinery has been renewed, though the window-seats remain. We cannot overlook the beautiful inlaid walnut cabinet of English or Dutch manufacture. The view from this room is particularly extensive. Another fine piece of furniture, but of Irish workmanship, is in the adjoining boudoir, which contains a Georgian mantel in Siena and white marble. Desart Court was burnt out by the IRA in February 1923 and its superlative contents all lost. Although the house was subsequently rebuilt under the supervision of Richard Orpen, this was razed to the ground in 1957. Has this country ever produced a more self-regarding architect than James Franklin Fuller? In 1916 he published Omniana: The Autobiography of an Irish Octogenarian which includes five appendices, each one dedicated to quotes from press reviews of his earlier, fictional books (‘We have never read a story with greater pleasure,’ Bath Chronicle, ‘As charming as a summer day’s ramble along an unknown lane, rich in unexpected turns and windings,’ Graphic, and so forth). The work also features highlights from his alternative careers, among them being an actor with regional troupes in England; one stint, he informs readers, came to an end the afternoon he found himself in the wardrobe room with nobody except the leading actress who ‘suddenly called on me to enact the part of Joseph while she herself assumed the role of Potiphar’s wife. The result was the same as that recorded in the Scriptures. I fled precipitately – leaving the lady to lock up her theatre.’ Fuller also trained for a period as a mechanical engineer, and was briefly a part-time soldier (he enrolled for what was supposed to be a British legion in Italy under Garibaldi, but to his indignation wound up in the suburbs of London ‘a mere ordinary recruit’ and had to buy his way out of the army). During the course of these adventures and misadventures, Fuller trained in the offices of another Irish-born architect, Frederick William Porter and then worked briefly with several English architects, most notably William Burges and Alfred Waterhouse, before securing a position in 1862 as district architect with the Irish Ecclesiastical Commissioners with responsibility for the north-west region of the country. James Franklin Fuller was born in Kerry in 1835, the only son of what can best be described as minor gentry although given his preoccupation with pedigree it is unlikely this is the term he would have chosen. Two further appendices in his autobiography (‘Humour and geniality exude from every line,’ Liverpool Post and Mercury) outline his forebears in both maternal and paternal lines: with regard to the former, he was able to trace his ancestry back to Charlemagne no less, with the latter from Duncan, first King of Scotland. Attention is duly paid in the book’s opening pages to the importance of one’s family possessing the right quarterings, namely those that confer the right ‘to appear at Court functions, presided over by the Sovereign.’ Readers will be relieved to learn that Fuller had these. Later he engages in some consideration of how the newly-rich presume to claim coats of arms to which, in his eyes, they have no right. That Fuller always felt himself above the concerns of the insufficiently well-quartered becomes apparent thanks to another passage in his autobiography (‘A rich treat of wit and wisdom and shrewd observation,’ Truth). Following the disestablishment of the Church of Ireland in 1869 and the loss of his position as one of its district architects, he established his own office in Dublin. From here, he writes, ‘For over half a century I carried on successfully a very extensive practice as an architect; and during the whole of that time, I violated – or rather, persistently disregarded, all the conventional rules which are supposed to be inseparable from success…A few months after opening my offices I discarded the regulation copying-press and the regulation letter-book…The ‘correct’ thing to do with letters received, was to preserve, docket and to pigeon-hole them, in the case of each separate client; whereas nine out of ten of them went into my waste paper basket immediately after receipt. I only preserved, until the finish of the particular business in hand, those that I thought likely to be necessary. I used my own discretion with regard to letters written by myself, only keeping copies of a few…I hardly expect to be believed when I say that, in issuing cheques, I never troubled to fill in the corresponding counterfoils…I kept no ledgers or books of any sort: I could not see the least necessity for them.’ Amazingly Fuller claimed his singular behaviour was ‘to the uniform satisfaction of my clients’ although we have seen that this was certainly not the case with regard to Sir Arthur Guinness. Strangely, although Fuller covers a great many subjects in his autobiography (‘A delightful arm-chair companion,’ Daily Graphic), he scarcely mentions many of the buildings for which he was responsible. One of these is shown here, St Anne’s in Clontarf, Dublin. 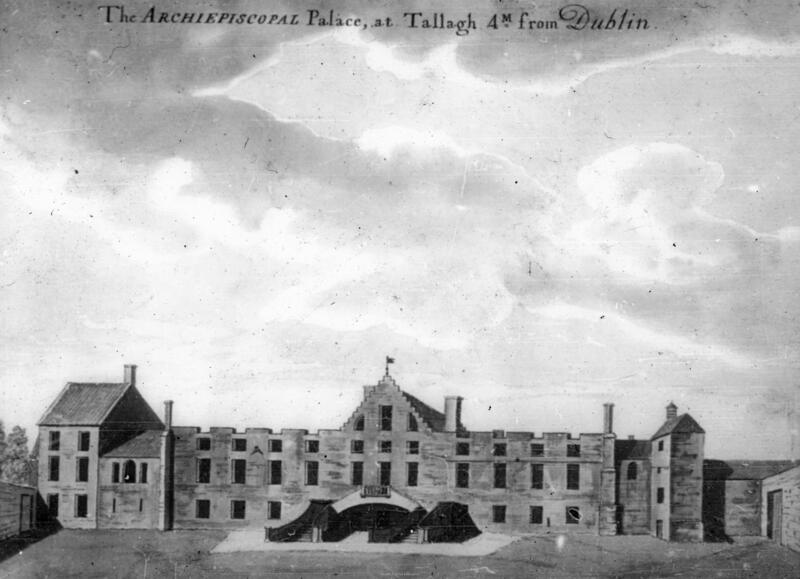 The original early Georgian house on the site was called Thornhill and owned by the Vernons who lived close by in Clontarf Castle. In 1835 Benjamin Lee Guinness, then head of the brewing dynasty, bought Thornhill and its immediately surrounding land: the estate was thereafter increased until it covered more than 500 acres. Meanwhile the old house was renamed St Anne’s after an ancient well of the same title in the area and was somewhat enlarged. However, the photographs here are of the building after it had been further embellished by Benjamin Lee’s son, the aforementioned Sir Arthur Guinness, Lord Ardilaun who from 1873 once more employed Fuller for this purpose. As can be seen, the eventual house had the appearance of a gargantuan Italianate palazzo, with vast double-height, top-lit galleried hall and equally substantial winter garden reached after an enfilade of reception rooms. The surrounding gardens were similarly transformed with extensive planting of specimen trees and the creation of a sequence of follies including a Herculanean Temple on a mock-ruined bridge abutment which served as a tearoom for the family and a Pompeian Water Temple of Isis by the duckpond. Even by the time work was completed at St Anne’s in the 1880s, the place had become an anachronism, out of scale and out of sympathy with the Ireland then beginning to emerge. After Lady Ardilaun’s death in 1925, the estate was inherited by one of her husband’s nephews, the Hon Benjamin Plunket, retired Bishop of Meath. Unable to afford its upkeep, in 1939 he sold St Anne’s and almost 450 acres of land to Dublin Corporation for £55,000. The enormous house designed by Fuller stood empty of its original contents and used by the Local Defence Force until gutted by fire in 1943; the ruins were demolished in 1968. By that time 200 acres of the estate had been given over to local housing, the remainder, including the walled garden, is now a public park. Perhaps it is as well Fuller did not dwell so much on the buildings he designed since in this case we are dependent on a collection of old photographs to recall what it looked like. Monday’s piece on Kingston College (see God Bless the Kings, September 1st) seems to have excited some interest, so readers might be interested to know what became of the King family’s adjacent residence, Mitchelstown Castle. This building, shown above, dated from the early 1820s when the third Earl of Kingston demolished the old house, replacing it with an immense castle designed by James and George Pain and costing in the region of £100,000. With 60 principal rooms, including a 93 feet-long gallery, drawing room, three libraries, morning room and vast dining room, Lord Kingston entertained lavishly until 1830 when, his candidate of choice having failed to win a local by-election, he lost his mind and had to be taken to England where he died towards the close of the decade. The fourth Earl followed his father’s example by being both a reckless spendthrift and then descending into madness. Ultimately the castle was occupied by the fifth Earl’s widow and her second husband, and by the latter alone after his wife’s death. In the summer of 1922 he was driven from the building by anti-Treaty forces who, on their departure, set the castle on fire: it has since been proposed that this only happened after the building’s valuable contents – including the King silver, family portraits and furniture – had been looted from the property. Although efforts were later made to seek compensation the sum offered by the Irish Free State was insufficient to allow Mitchelstown Castle be reconstructed. Instead its cut stone was sold to the Cistercian monks of Mount Melleray, County Waterford who used it to build a new abbey. As can be seen below, the site on which the castle stood is today occupied by the Dairygold Food Co-Operative Society’s factory, which like the earlier building dominates the horizon, albeit in a somewhat less attractive fashion. ‘To delight in the aspects of sentient ruin might appear a heartless pastime, and the pleasure, I confess, shows the note of perversity.’ From Italian Hours (1873) by Henry James. From Les Ruines, ou méditations sur les révolutions des empires (1791) by Constantin François Chasseboeuf, comte de Volney. From The Duchess of Malfi (1612) by John Webster. From Denis Diderot’s Salon (1767). At fourscore I came home. I asked him who there was at home. All covered over with trees and bushes. Pheasants flew down from the beams of the roof. And by the well, some wild mallows. I’ll pluck the mallows and make soup. But there is no one to eat them with. Chinese poem by an unknown author, translated by Arthur Waley (1919). Whose agonies are evils of a day! A world is at our feet as fragile as our clay. . . .
From Childe Harold’s Pilgrimage (1812-1818) by Lord Byron. Through the worn turrets wave their trembling heads. I left the mantling shade in moral mood . . .
Sigh’d, as the mould’ring monuments I viewed. Here Time has pass’d What ruin marks his way! From Poems chiefly Pastoral (1766) by John Cunningham. Sunk in their urns; behold the pride of pomp. From The Ruins of Rome (1740) by John Dyer. ‘…Since first these ruins fell, how chang’d the scene! Since first Oblivion call’d the spot her own. For everlasting lies a mystery. From Observations on the River Wye, and several parts of South Wales, etc. relative chiefly to picturesque beauty; made in the summer of the year 1770 (1782) by William Gilpin. Today an unremarkable suburb of Dublin, Tallaght was for many centuries a frontier settlement, marking the edge of the Pale beyond which the Irish Aesthete’s more bellicose ancestors were inclined to engage in assault and pillage. A monastery had been established here in the eighth century by St Maelruan but it was sacked by the Vikings in 811 and suffered sundry other attacks thereafter. However, the religious link meant that when Tallaght came under the authority of the Archbishop of Dublin in 1179, a castle was built and this in turn became an archiepiscopal retreat. The old castle having fallen into dilapidation, it was largely rebuilt soon after 1729 by then-Archbishop John Hoadly but within a century this property too was deemed no longer suitable for habitation: in 1821 Archbishop Lord John Beresford disposed of the property by act of parliament and it passed into private hands. Another programme of rebuilding followed before the place was acquired in 1856 by members of the Dominican order whose St Mary’s Priory remains on the site still, incorporating a single tower of the original castle. The engraving above shows the archiepiscopal palace not long before it ceased to serve this function and was largely demolished. A contemporaneous account by James Norris Brewer offers fascinating information about its appearance, the palace described as being ‘a spacious, but long and narrow, building, composed of the grey stone of the country, and is destitute of pretensions to architectural beauty. The interior contains many apartments of ample proportions but none that are highly embellished.’ These included a hall measuring twenty-one foot square and lit by two tiers of windows, and a drawing room thirty-three feet wide and twenty-one feet wide. All now long gone and recalled only by a handful of images such as this one.